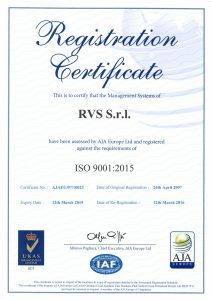 The RVS quality management system has been audited and certified as complying with ISO 9001:2015 by AJA Registrars Europe. 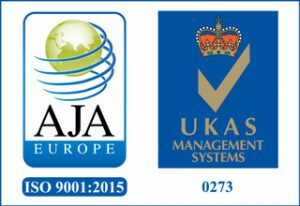 Compliance with certification principles, which imposes constant improvement of quality management, has always been a top priority for the company which aims to furnish a top-flight service and high quality products to its clientele. 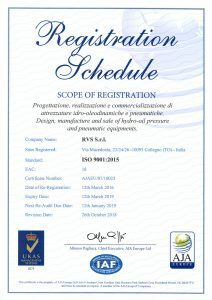 RVS confirms compliance of its products with the most significant EC Directives with a declaration of conformity that accompanies each product; power packs are always furnished complete with detailed technical documentation and CE compliant use and maintenance handbooks. In view of the importance of design parameters in the case of hydraulic power packs installed on cableways, ski lifts etc., RVS cooperates with the Bureau Veritas Italia S.p.A. Notified Body for certification of compliance with current safety regulations and standards.